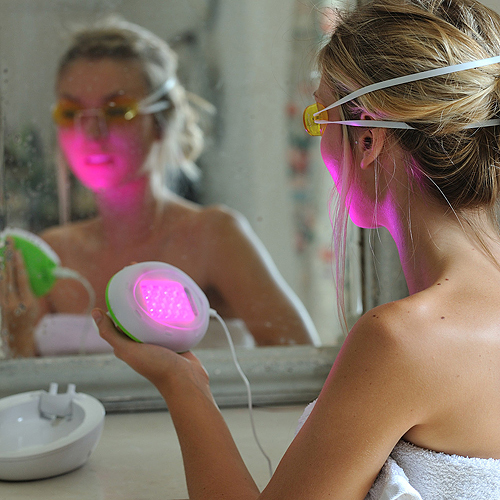 Lumie Clear is a portable acne L.E.D. 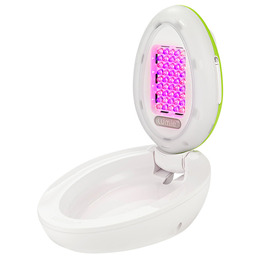 treatment lamp that naturally helps alleviate the effects of acne. 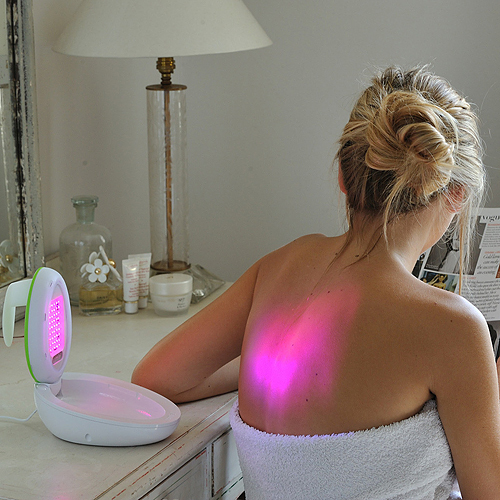 Lumie Clear utilises an effective technology known as Light Therapy. Light Therapy is a safe and natural way to relieve the symptoms of mild-moderate acne vulgaris. The Blue LEDs in this product kill bacteria, whilst the Red LEDs reduce inflammation and heal the skin simultaneously. Lumie Clear’s Blue LEDs and Red LEDs each produce a different form of wavelength light to complement each other perfectly: the Blue LEDS emit the short wavelength light that`s known to kill the bacteria and the Red LEDs produce long wavelength light to soothe inflammation. In clinical trials, four weeks of everyday use with a combination of both blue and red light was shown to make a real difference and, after 12 weeks, the testers’ skin was (on average) 76% less inflamed and 58% clearer. Below are reviews of Lumie Clear - Portable Acne L.E.D. 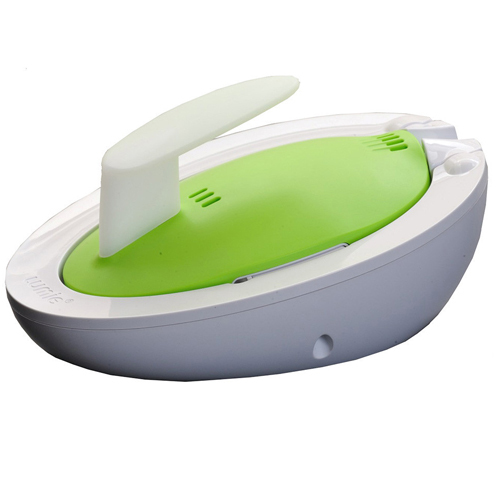 Treatment Lamp by bodykind customers. If you have tried this product we'd love to hear what you think so please leave a review. Made little difference to my mild acne and the light can only do a small area at once so time consuming. However Bodykind offered the best prices anywhere for this device and delivery was very quick. The price had previously put me off buying this product but I am so glad I did. My 14 yr old son's acne was getting worse despite using face washes etc. I was reluctant to start using medication so decided to give it a try. After only a couple of weeks' use, there is a significant improvement. It takes a bit of commitment to use it daily for the required time, but definitely worth it. I bought this for my son and hes been using it every day for a week....OMG I can already see the difference. He has stopped using the creams the doctor has given him whilst using this and I am considering telling him to stop taking the antibiotics (not that they seemed to make a difference). I really wished I had invested in this 18 months ago. His spots are no longer red and inflamed, just small white heads. I look forward to seeing how things are in another week or two. In my opinion this piece of equipment is worth every penny, especially when private light treatment can cost £30 a session. I bought this for my 14 year old as we were struggling with over the counter treatments and antibiotics. We have only had it for a week but I am gobsmacked by the results so far. Amazing! Let's hope it continues. I bought this for my daughter as she developed acne in her early 20s and has for the last few years battled with it, taking courses of antibiotics changing diet and buying expensive facial products. After a couple of weeks use there was a marked difference to her skin and after 5 or 6 weeks her complexion was lovely again. She has the odd spot at times but they soon clear up! However she is very regimented and uses it every night. If you can commit to using it properly it is a fantastic product and is well worth the money ! Would recommend it ?? I believe this device truly works, as long as you keep it up. I have moderate acne on my forehead and cheeks and using this for 45 minutes per day seems to be working, this is my fourth week and the difference is noticeable. Redness and uneven skin tone has reduced considerably. This product is remarkable. I bought this expecting a fairly good product, but the results have changed my life. I did not have acne, instead I had something called "hyper pigmentation" or post acne marks; and in some way I thought it was worse than the acne itself. I had redness all over my cheeks and I could not stand to look into the mirror. After just 1 month of using lumie, the redness is almost gone. The only downside I can think of is the goggles you have to wear during treatment- but that's a small price to pay, trust me. I have not been paid to say this and the comment may seem a little bit eccentric, but I'm just so happy with the transformation. Seriously buy this product I can not stress how good it is. I purchased the Lumie Clear and after the first session I saw a reduction in inflammation the next day. One week on I look a different person. I am so pleased! I am 38 and have suffered from mild - moderate acne since my mid 20's. I have tried lots of things over the years such as retin a, proactiv, salicylic acid, birth control pills all with little of no effect (Apart from a medication which did completely clear up my skin, but gave me anxiety attacks for a further 3 years and made my hair really thin so I wouldn't risk taking them again). I have been using the Lumie Clear Device for the last 9 weeks and have had fantastic results. My worst acne areas were my forehead and right lower cheek/chin so I have used the Lumie pressed right up against my skin on each of these areas for 15 mins daily. The device has a timer and automatically switches off when the recommended time of 15 mins is over. I feel so much more confident and it is so nice to be able to talk to people and look them in the eye without constantly worrying about how your spots look to them and trying to hide your face away. I have been using this product for two weeks now and I am already noticing that it is reducing inflammation and helping skin to heal more quickly. Hopeully I will continue to see great results! 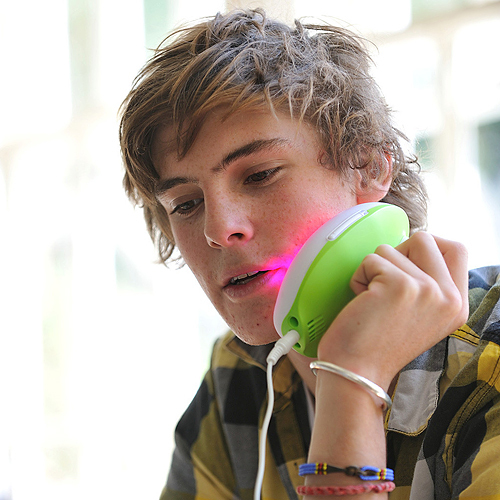 Lumie Clear is a portable acne L.E.D. treatment lamp. Light therapy is a safe natural way to relieve the symptoms of mild-moderate acne vulgaris. Blue LEDs kill bacteria whilst the Red LEDs reduce inflammation and heals the skin.